One of the more intriguing recordings to come my way recently is this CD from ClassicO, a European label that seems to have joint parentage in the Czech Republic and Denmark. Doubly intriguing in that the "recomposition" of the St. Luke Passion is based upon a score that has always had a disputed element to it and its ownership. The story of the original St. Luke's Passion is this. There is a handwritten score that can be dated with some certainty to about 1730. 23 of its 57 pages were in Bach's own hand, the rest presumably by his son, C.P.E. The evenness of the handwriting in these 23 pages and the lack of amendments and revisions point to this being a copy made by Bach himself of a score that interested him. Since then it has generally been felt by musicologists that the work was not Bach's own - Telemann's name has been used as a possible composer. That Bach found something in another's work when his own was supreme is a minor puzzle. 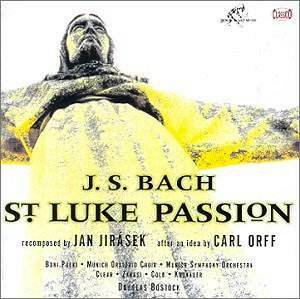 The story of the present recording links Bach, Carl Orff and Jan Jirasek (b. Bohemia 1955). Orff felt that the "Bach" St' Lukes Passion was too long, too "wordy" and that a more compact version was needed. He worked on this, finishing it in 1932, five years before Carmina Burana brought him to prominence. Then the score was burned and destroyed in World War II. Jirasek was approached by Bavarian Radio to recompose the work based on what remained and his own musical sensibilities. Working mainly from from Orff's hand-written annotations to a piano reduction of Bach's work, he covered the same ground when everything redundant and not vital to the story was stripped out. It left an outline work with a high number of recitatives and a few chorales. The conclusion he came to was the same as Orff's - that these needed to be orchestrated. So, on this disc the Passion is in two parts made up of 53 sections and is a comprehensive re-telling of the New Testament story. I do not know if this work has been performed live - probably it has - but a listener who knew the original Bach setting would see a great deal he would recognise. The changes and revisions have been done with taste and a keen musical brain is behind them. The differences are mainly from the large percussion section with gongs, tam-tam, chimes and more that add some rich colouring but are never intrusive, and there are some conventional but modern harmonies. Jirásek, and Orff before him, found that they had at one place in the score five recitative sections before another short choral passage changed the pattern - hence the changes they made. The opening recitative for the Evangelist will give an indication of the revisions. The conventional harpsichord continuo precedes the soloist, then horns, an ominous sounding drumroll, brass chords follow -nothing brash or loud - changes to coloration rather than a radical overhaul. Nothing startlingly different to a respected original, but enough to add something they felt was needed. That is typical of the work throughout and it succeeds. There are notes in English but the libretto has no translation from the German. The soloists and chorus are excellent, the recording is well focussed and has a good balance, and overall I would rate the interesting and challenging project well worth a hearing. It is a "try before you buy " recording that you may take to.